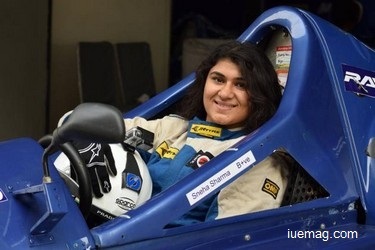 The lady racer who is entitled 'India's fastest lady' by the Mercedes Young Star Driver Programme shares her story with iUeMagazine of how and why, age does not matter to act upon your dreams. History is created, only by those who take the path, that is not much used. Read on! Meet Sneha Sharma, who at the age of 23, today stands as an inspiration for millions of women who dream of pursuing what they want to, and not what they are made to. 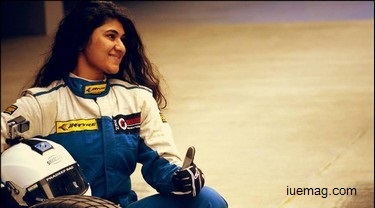 India’s only female Formula 4 Racer who at the age of 16, started her dream to make it big in the field of racing, did not make it easily this far, especially in a country which is developing and is believed to be male dominant. As a child, machines caught her interest when she would sail with her father who worked in the merchant navy and eventually, the interest turned into seriousness when she visited and participated at the local karting tracks. Pursuing racing as a career was not uncomplicated when she knew the cost involved was equally hard, which made her train herself a pilot at the US, so that, she could earn a sum to support her career as a racer, but, there was again a hurdle when she had to convert her US license to an Indian one. Her strong dreams did not allow her passion to be let down, because of which, she continued to work harder and learn a lot to get into the Indigo Airlines, which became her first life saver to help build her dreams to become a professional racer. Involved in her flashback, she says, “Born in a middle-class family, I couldn’t pressurize my parents to pay for my training. So, I took a personal loan to fly to the US to get trained to become a pilot. When I got back, I realized I had to work harder to not just convert my license, but also, to get a job at the airlines in India where there are many pilots who are unemployed. I was firm in believing that I could actually do it”. Apart from her preparations to join the airlines, Sneha continued to pursue her education in the field of science which is never considered easy. While she went for her practices at the tracks, she carried her books and managed to study wherever possible. Her first set of teachers with respect to racing, were the mechanics who taught her the basic techniques like braking in and cornering. As she implemented these techniques, she slowly learned more through her experience in the local races. On one end, there was preparation for her journey as a pilot, which could support her dream of racing and on the other end, her preparation for the examinations in her field of study also continued, along with which she ensured to participate in the races to keep herself in touch with racing. The struggles did not just stop there, because, it was more important for a racer to keep oneself fit and healthy. Sneha, who weighed 90 kilograms then, had to also focus on her fitness and hence, had to spare time for her gym where she had to work out for hours because of which she lost 30 kilograms. At the age of 20, she stepped into the Indigo Airlines where she began her flight and worked for upto 13 hours a day, flying. Now, was the double trouble because the schedule at work did not allow Sneha to practice for her races, but, she could only plan well to participate directly in these races on her personal leaves. Initial days were not easy to manage since it took more time for her to plan them really well such that, no work interfered in each other’s schedules. The gym was again in her to-do list as always which also had to be considered in the plan. Gradually, her plans were implemented, where she slowly learned to manage every aspect of her life - flying, exercising and racing. Support from the airlines helped her for more practice sessions to get better results. Her talent was first recognized by the Rayo racing team which held hands to give her an opportunity to help showcase her potential at the Rayo racing National championship and Sneha, has till date, never looked back after this. She continued her participation at races like the MRF National Go-Karting, JK Tyres Championships and more. By the time she felt everything would go smooth after this, there were more challenges she shares, she had to overcome, once she began her participation nationally. “I used to be the only female competent in almost all the races I would participate. Not many would support me do this, but, there were a lot of men who criticized, asking me to go back or sometimes, blamed me for anything wrong that would happen at the tracks too. There was a lack of that support I always needed. Especially, in the initial days, my parents too weren’t happy with my passion towards racing, but, as they found me doing all that it could take to become a racer, they realized that I would build a career here itself and began to support. None of the challenges could stop me because, I was sure of what I wanted to do and such criticism actually pushed me harder to keep myself stronger mentally and physically. All that I know is, once my helmet is on, I am nothing else, but a race car driver”. As she grew up the ladder, there was more cost involved when there were requirements for better cars or equipments or for practice sessions. Currently, she has received some part of sponsorships from Malaysia and Germany, but there are more needs to participate in higher levels of championships. Her efforts to earn them has never been less, but she feels, “Motor Racing in India is expected to be supported more by those who can sponsor. I do not blame the country or the people since we are all developing but, there is a huge scope for the industry and I believe more sponsors will come forward to support passionate racers like me to help make our country and the youth proud. I am glad to see JK Tyres, Indigo Airlines which are currently sponsoring a part of it and also the Zen Microsystems from Pune which provides with Vbox support equipments”. She also believes that more people will join to support her dreams to participate internationally. Sneha has so far been the reason to make us all proud by winning more than six races and has won 9 runner-up positions. Apart from this, she was named ‘India’s fastest lady’ in Mercedes Young Star Driver programme, she has also been the only woman to qualify into the final round of the KCT of the MAI National Karting Championship and has also scored a four-stroke category in her first ever Formula Car Race at JK Tyre National carting Championship 2009. She also reminds herself of the qualities that instilled such attitudes in her from her childhood days, “I have always been a learner and would observe all that happened around me. Curiosity was something I always had and I think these qualities became the reasons for what I am today!”. When asked about the race that inspired and taught her the most, she recalls, “My first Rotax rookie race, where I happened to get the podium finish, I did not have much money for the equipments and parts. My kart did not just start and I had almost given up when a gentleman came and did something to my kart and it started. I was still unsure if I could win, but I am never scared of losing or dying, I am only scared of not finishing the race. Anyways, I only had a hope that I would finish. I joined at the end and started late, but was proud to reach the second place” and such races, incidents helped grow the confidence in her . Sneha also shares about her social life, “I don’t have a social life as such, because, most of my time goes in flying, and in the gym. I do have a very few but great friends who believe in me, know me well and understand that we cannot spend much time with each other. They have always been supportive in my work”. And Sneha envisions of “helping youngsters achieve their dreams and pursue their passion”, to which she also adds, “The youth of our country have high potential, but, they need examples to help them understand they can do more. I wish to be one such example and inspire more youngsters to become what they want to”. There are many such individuals in every part of the world, but, the strong will power to stand by your dreams, no matter what hurdles you need to face, is not with held by many. Sneha is now a hope for many, to believe in themselves. Will the youth continue to wait for more such examples or become examples themselves? A question to be answered by your hearts and the decision to be taken by your minds. Any facts, figures or references stated here are made by the author & don't reflect the endorsement of iU at all times unless otherwise drafted by official staff at iU. This article was first published here on 10th November 2015.